Update entries in Account, Campaign, Lead, or Contact objects. To use this integration you must be on the Performance, Unlimited, Enterprise, or Developer editions of the Salesforce Sales Cloud. These are the editions for which Salesforce opens their API. For more information check here. We need an open API to integrate Blitzen. Now let's go through the steps to integrate. Navigate to the ‘Integrations’ section in the left-side panel and click on the ‘Salesforce’ app. It's possible that you will be asked for a verification code. If this is the case, check your email, Salesforce should send you one immediately. 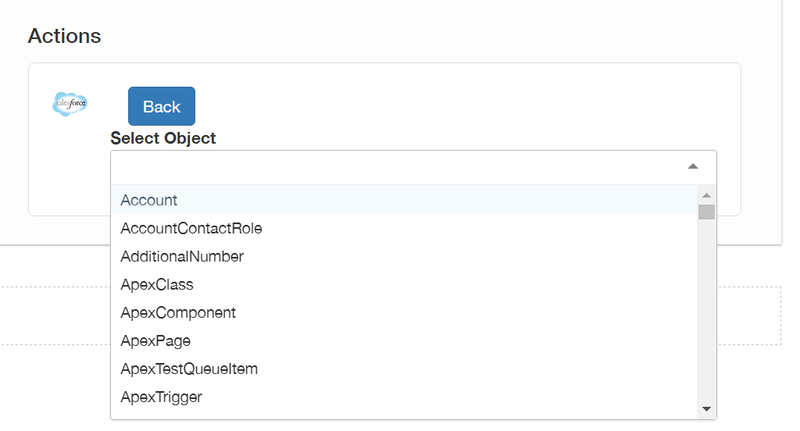 Drag the Salesforce App over into your workflow as an output and configure the app by clicking the ‘+’ icon. Choose whose credentials you would like to use. The default setting is to sync all submissions from the input form or survey. If that is not what you wish to do simply add filters. Click‘ Add custom filter’ and use the three fields to create a segment. You will then be asked to choose the destination your data will sync to. What can you do with the Salesforce Integration? Each object will bring up a different list of Salesforce fields. Some fields will be mandatory and some optional. Fields can be filled by form data or by available default Salesforce options like 'True' or 'False'. Pro tip: Hidden fields autofilled by Query Parameters will allow you to add data to form entries that form submitters will not see. Great for ID numbers and linking variables. Updates to Contacts, Leads, Accounts, and Campaigns, will be de-duplicated by email. If you have the same contacts in your Salesforce account as your Blitzen account, you will be able to Lead Score and create Segments based on changes in Salesforcce Lead and Contact data. For example: If you wanted to see leads or contacts converted you could create a segment and make a rule based off of the conversion variable in Salesforce.